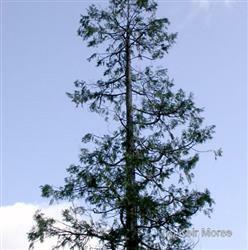 Calocedrus decurrens is a desirable tree native to western North America. It is a large tree, typically reaching heights of 100' and a trunk diameter of up to 6', and with a broad conic crown of spreading branches. The leaves are bright green and the bark a reddish brown. It is by far the most widely-known species in the genus, and is often simply called "Incense Cedar" without the regional qualifier. This tree is the preferred host of a wood wasp, Syntexis libocedrii which lays its eggs in the smoldering wood immediately after a forest fire.